Social media is an invaluable marketing tool, but it also changes rapidly, leaving businesses wondering how to adapt their strategies. Thankfully, there’s lots of data on social media usage to help direct your methods. Here are some statistics that can shed some light on how and where your social media marketing dollars are best spent. 1. There are 2 billion active daily users on Facebook. While there have been rumblings about the decline of Facebook and the rise of other platforms, the truth is that this social media giant is still very much alive. 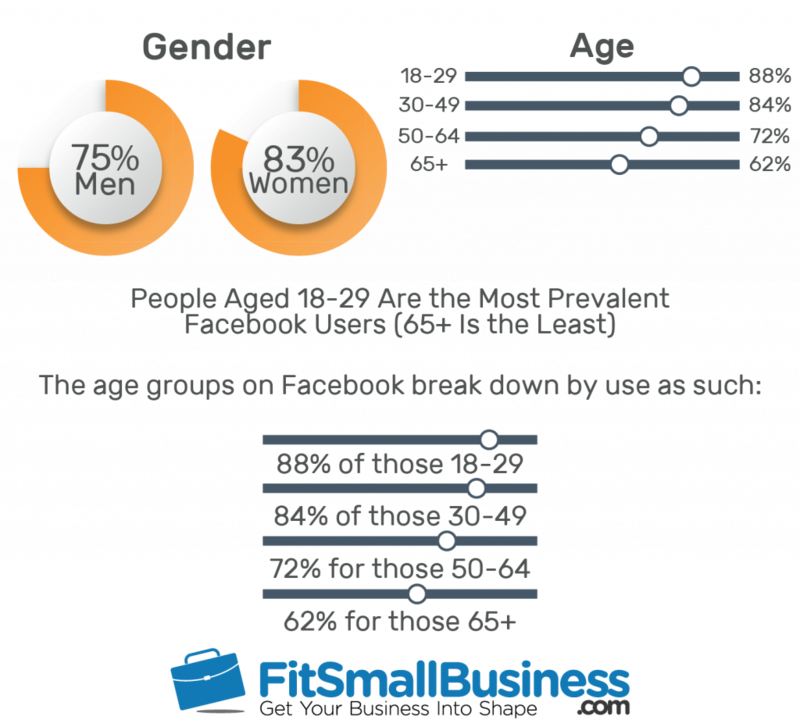 Not only do the daily users rank in the billions, but it’s also been shown that around 80% of 18- to 49-year-olds are active on Facebook. That’s a huge chunk of the population, all available in one social media platform. 2. 91% of Facebook ad revenue is brought in via mobile. Mobile advertising is more critical than ever as we see in this powerful stat. Most Facebook users are active via mobile, whether through phones or tablets, making mobile Facebook advertising a prime avenue for reaching your audience. 3. Research shows that most Facebook users are active in the afternoon hours. Are you looking for likes? The most engagement on Facebook occurs between noon and 4 p.m., so this is the best time to launch posts or get your live feed going. 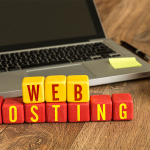 It’s also been proven that Wednesday through Friday are the best days of the week to post, as more users are active and engaged. 4. 500 million tweets are sent per day. Twitter users are highly engaged as evidenced by the number of tweets sent per day. 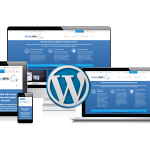 This makes it a great platform for interacting in a more personal way with your target audience. 5. 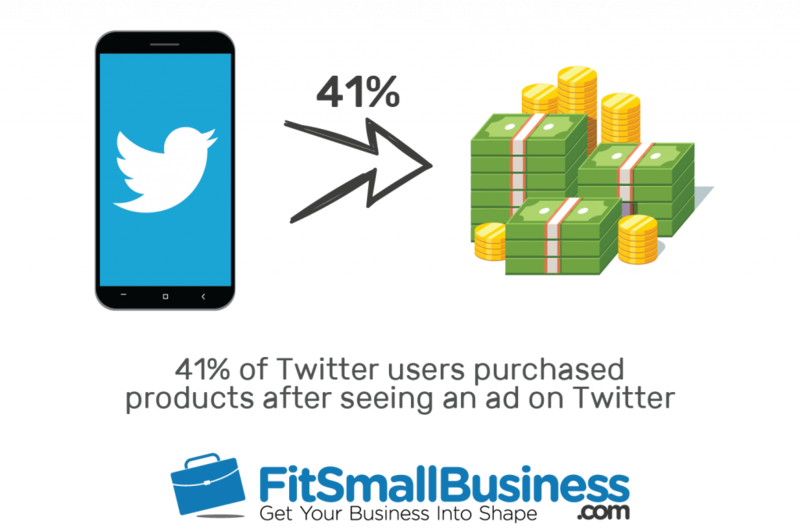 41% of Twitter users purchased products after seeing an ad on Twitter. Pretty impressive, right? Social media advertising is still incredibly effective as evidenced by the staggering number of Twitter users who were converted through ad exposure on this one platform alone. 6. 85% of small and midsize businesses use Twitter to provide customer support to their clientele. Because of how easy it is for users to connect with brands on the platform, Twitter is the ideal place to respond to customer feedback. This makes it a great tool for small and midsize businesses (SMBs) to engage their customer bases in a personal, meaningful way. 7. 1 in every 2 millennials uses Pinterest monthly. Millennials now make up the largest percentage of the workforce, so if 50% of them are using Pinterest, you should ensure they can find your business there. 8. For every dollar spent on ads, Pinterest delivers $2 in profit. Many pinners use Pinterest primarily for planning future purchases, so this platform has a very high return on investment (ROI) on advertising spend. Thus, when you target carefully and focus a specific amount of your marketing spend on Pinterest, you may see a hefty conversion rate and an accompanying revenue boost. 9. More than 50% of new Pinterest users are men. If you thought Pinterest was primarily for the ladies, you’d be dead wrong. More than half of Pinterest’s new registrations are men. This has not historically been the case so, in 2019, be sure to tailor your Pinterest marketing efforts to appeal to this broadening demographic. 10. 43% of marketers say they have sourced at least one customer on LinkedIn. LinkedIn is a prime platform for making connections, but it can also be highly effective for lead generation. Marketers, especially in the business-to-business (B2B) sphere, are discovering more opportunities for expanding their customers through this avenue. 11. LinkedIn has more than 260 million active daily users. Although not quite as hefty as Facebook’s 2 billion, LinkedIn still pulls in its fair share of daily users. Additionally, the majority of these users are high income and/or college graduates, which gives a unique insight into the demographics of your target audience on this platform. 12. LinkedIn SlideShare reaches around 70 million unique visitors every month. If you’ve ever used LinkedIn SlideShare to source information, you’d be just one of the millions who use this feature on the regular. LinkedIn SlideShare has become an indispensable way to bring in leads as well as develop thought leadership, so take advantage of this content stream in 2019. 13. As of 2018, Instagram is the fastest-growing social media platform. This past summer Instagram announced that it had jumped from 800 million active users to 1 billion, all in less than one year. This spurt put Instagram well ahead of other platforms in terms of its growth rate. By increasing your Instagram presence and focusing on engagement, you can take advantage of this expanding audience. 14. About one-third of people who make $75,000 a year or more are on Instagram. Especially for business-to-consumer (B2C) businesses, it’s critical to know where to find an audience with disposable income. Instagram has a considerable percentage of users who pull in high salaries, so depending on your target audience and product offerings, this may be the platform to concentrate your ad spend. 15. Images posted via Instagram get 23% more engagement than those posted through Facebook. 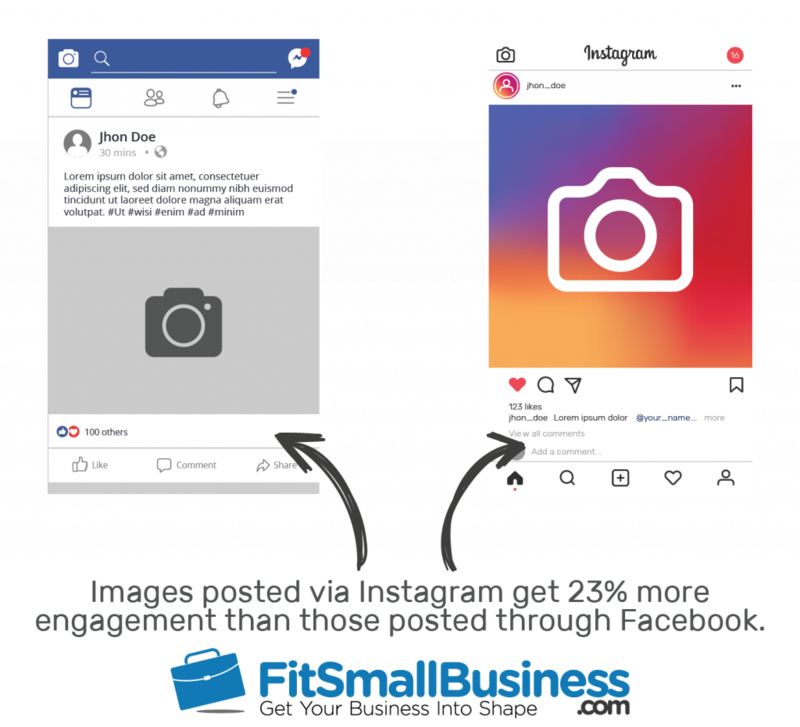 The whole point of posting on social media is to capture the interest of an audience, and this stat shows just how powerfully Instagram performs in this area. Of course, a strong social strategy should always incorporate Facebook. However, by being more active on Instagram, you can develop a stronger brand presence that creates interaction and awareness. 16. 60% of Snapchat users are younger than age 25. Snapchat can be a mystery for some of us older folks, but don’t let it daunt you. A huge number of young millennials and Gen Z members are highly active on this platform, so take the time to learn some Snapchat basics, and you’ll be much more effective at reaching this audience. 17. 45% of college students will open snaps from brands they don’t know. This means that even if you’re not yet well-known on Snap, you still have a good chance of penetrating new audiences. 18. 57% of brand content on Snapchat consists of video. By now, you know that video content is the content marketing of the future – and this is especially true on Snapchat. Don’t neglect video content in your social media marketing plan for 2019. Changes occur quickly in the world of social media due to the shifting generations and advances in technology. As you refine your marketing plan for 2019, keep these stats in mind so that you not only keep up but stay ahead of the tides. Do you have your own burning question on social media marketing or an interesting fact to share? Leave us a comment below.